This quickstart shows you how to get started using Microsoft Azure Cache for Redis with .NET. Microsoft Azure Cache for Redis is based on the popular open-source Azure Cache for Redis. It gives you access to a secure, dedicated Azure Cache for Redis, managed by Microsoft. A cache created using Azure Cache for Redis is accessible from any application within Microsoft Azure. 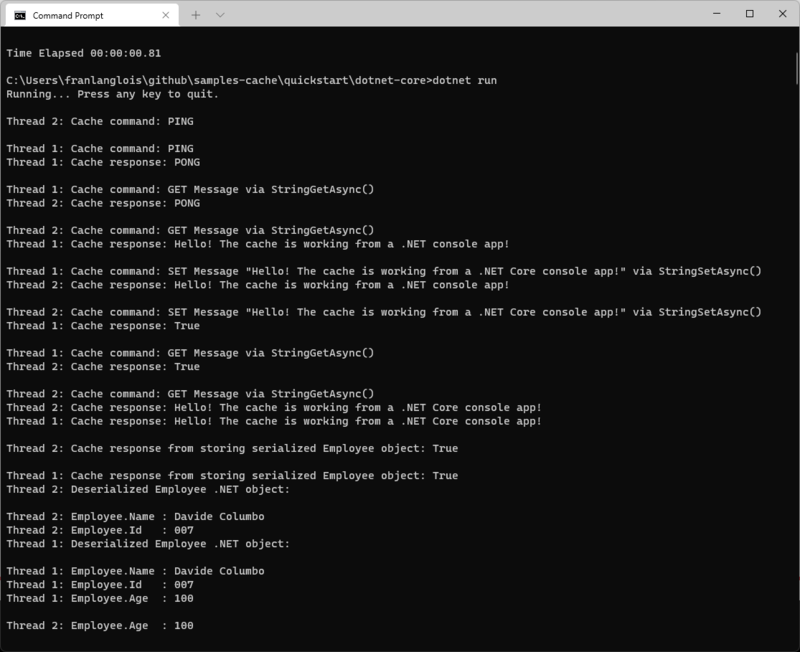 In this quickstart, you will use the StackExchange.Redis client with C# code in a console app. You will create a cache and configure the .NET client app. Then, you will add, and update objects in the cache. The StackExchange.Redis client requires .NET Framework 4 or higher. To create a cache, first sign in to the Azure portal. 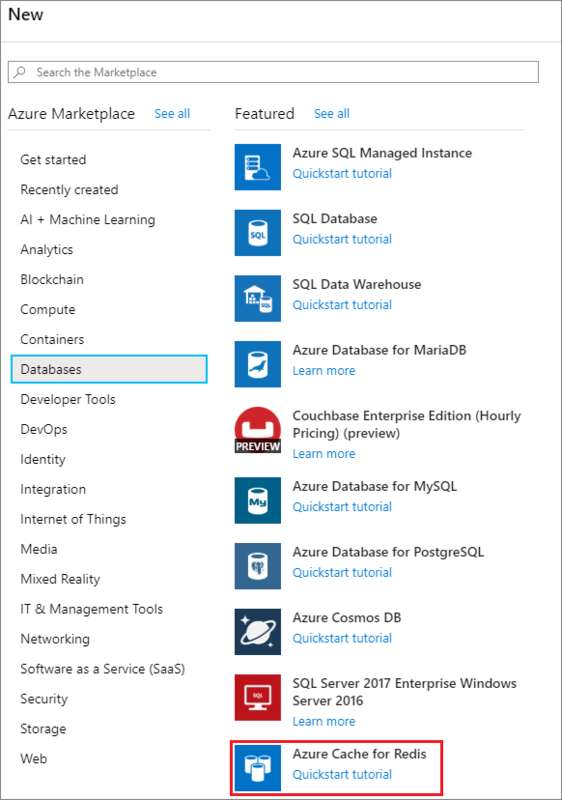 Then select Create a resource > Databases > Azure Cache for Redis. 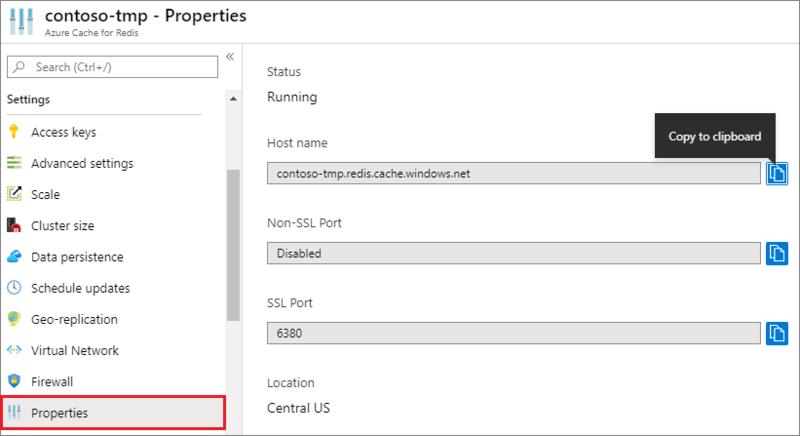 In New Azure Cache for Redis, configure the settings for your new cache. DNS name Globally unique name The cache name. It must be a string between 1 and 63 characters and contain only numbers, letters, and the - character. The cache name cannot start or end with the - character, and consecutive - characters are not valid. 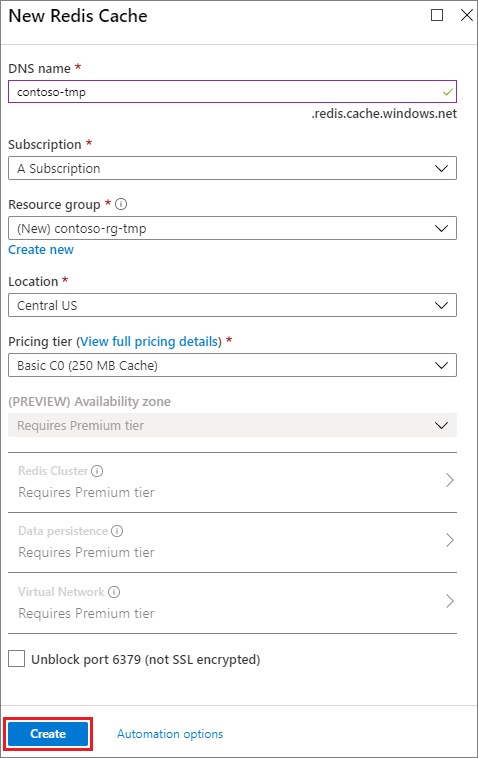 Subscription Your subscription The subscription under which this new Azure Cache for Redis instance is created. Resource group TestResources Name for the new resource group in which to create your cache. By putting all the resources for an app in a group, you can manage them together. For example, deleting the resource group deletes all resources that are associated with the app. Location East US Choose a region near to other services that will use your cache. Pricing tier Basic C0 (250 MB Cache) The pricing tier determines the size, performance, and features that are available for the cache. For more information, see Azure Cache for Redis Overview. Pin to dashboard Selected Pin the new cache to your dashboard to make it easy to find. After the new cache settings are configured, select Create. It can take a few minutes for the cache to be created. To check the status, you can monitor the progress on the dashboard. After the cache has been created, it shows the status Running, and is ready for use. 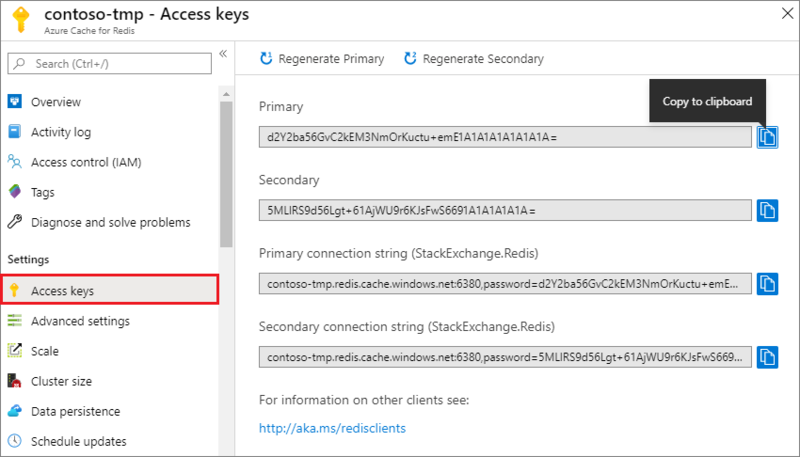 When connecting to an Azure Cache for Redis instance, cache clients need the host name, ports, and a key for the cache. Some clients might refer to these items by slightly different names. You can retrieve this information in the Azure portal. To retrieve the access keys by using the Azure portal, browse to your cache and select Access keys. To retrieve the host name and ports, select Properties. Create a file on your computer named CacheSecrets.config and place it in a location where it won't be checked in with the source code of your sample application. For this quickstart, the CacheSecrets.config file is located here, C:\AppSecrets\CacheSecrets.config. Replace <cache-name> with your cache host name. Replace <access-key> with the primary key for your cache. In Visual Studio, click File > New > Project. Under Visual C#, click Windows Classic Desktop and then click Console App, and OK to create a new console application. In this section, you will configure the console application to use the StackExchange.Redis client for .NET. In Visual Studio, click Tools > NuGet Package Manager > Package Manager Console, and run the following command from the Package Manager Console window. Once the installation is completed, the StackExchange.Redis cache client is available to use with your project. In Visual Studio, open your App.config file and update it to include an appSettings file attribute that references the CacheSecrets.config file. In Solution Explorer, right-click References and click Add a reference. Add a reference to the System.Configuration assembly. The connection to the Azure Cache for Redis is managed by the ConnectionMultiplexer class. This class should be shared and reused throughout your client application. Do not create a new connection for each operation. Never store credentials in source code. To keep this sample simple, I’m only using an external secrets config file. A better approach would be to use Azure Key Vault with certificates. This approach to sharing a ConnectionMultiplexer instance in your application uses a static property that returns a connected instance. The code provides a thread-safe way to initialize only a single connected ConnectionMultiplexer instance. abortConnect is set to false, which means that the call succeeds even if a connection to the Azure Cache for Redis is not established. One key feature of ConnectionMultiplexer is that it automatically restores connectivity to the cache once the network issue or other causes are resolved. The value of the CacheConnection appSetting is used to reference the cache connection string from the Azure portal as the password parameter. // as shown in the previous example. Azure Cache for Redis has a configurable number of databases (default of 16) that can be used to logically separate the data within an Azure Cache for Redis. The code connects to the default database, DB 0. For more information, see What are Redis databases? and Default Redis server configuration. Cache items can be stored and retrieved by using the StringSet and StringGet methods. Redis stores most data as Redis strings, but these strings can contain many types of data, including serialized binary data, which can be used when storing .NET objects in the cache. Press Ctrl+F5 to build and run the console app. In the example below, you can see the Message key previously had a cached value, which was set using the Redis Console in the Azure portal. The app updated that cached value. The app also executed the PING and CLIENT LIST commands. Azure Cache for Redis can cache both .NET objects and primitive data types, but before a .NET object can be cached it must be serialized. This .NET object serialization is the responsibility of the application developer, and gives the developer flexibility in the choice of the serializer. One simple way to serialize objects is to use the JsonConvert serialization methods in Newtonsoft.Json and serialize to and from JSON. In this section, you will add a .NET object to the cache. Press Ctrl+F5 to build and run the console app to test serialization of .NET objects. If you will be continuing to the next tutorial, you can keep the resources created in this quickstart and reuse them. In the Filter by name... textbox, type the name of your resource group. The instructions for this article used a resource group named TestResources. On your resource group in the result list, click ... then Delete resource group. In this quickstart, you learned how to use Azure Cache for Redis from a .NET application. Continue to the next quickstart to use Azure Cache for Redis with an ASP.NET web app. Create an ASP.NET web app that uses an Azure Cache for Redis.